UniServe™ NXT our REAP platform helps build agility by developing enterprise applications that enable seamless collaboration with employees, processes, customers, partners and connected things which is essential to remain relevant in the digital era. UniServe™ NXT platform unravels the ability to create responsive UIs for applications enabling business and IT stakeholders to work collaboratively for faster application development. The presentation layer enables the creation of responsive solutions as visualized by the designer in real time. It allows designers to map critical solution elements, such as Data Models, and Workflow Nodes to UI widgets through drag-and-drop mode to give life to otherwise static UI screens. 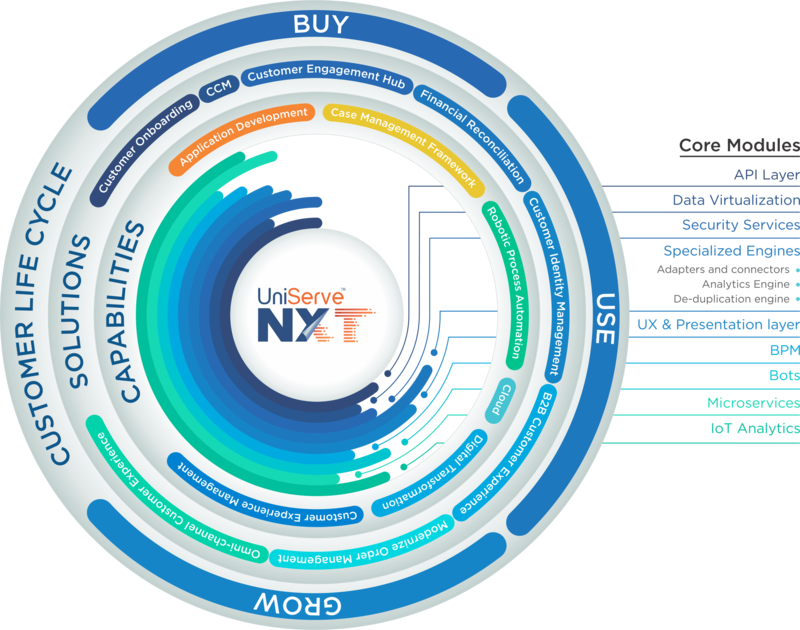 The most versatile of UniServe™ NXT is the Data Virtualization layer. The layer helps in bridging data silos and offers the ability to generate simple, context-based, purpose oriented data type packages from a master data model that is sourced from disparate data sources and applications to meet the needs of other layers – UI, and Workflow. Comprising the ability to connect to disparate systems with its rich support for Web Protocols and IoT Protocols, the API layer is the fundamental layer of UniServe™ NXT platform. The layer helps designers create and expose business process related secure APIs to other systems to reverse connect to UniServe™ NXT platform. This enables collaborative business models by making it easy to connect to IT Systems and connected devices. Workflow layer of UniServe™ NXT platform helps digitalization and process automation in quickest time. Built on XPDL standard, this layer binds all the other layers with its rich user interface. The UI enables you to design complex process flow to orchestrate the working of a solution with a simple drag-and-drop of critical elements published from other layers. This layer also helps in designing experimentation workflows that can run in parallel to production workflow. The UniServe™ NXT platform comes with specialized engines that support connectivity. The platform comprises built-in library of engines to choose from while building applications. These include adapters that connect to legacy applications, data de-duplication capabilities, alerts and notifications to third-party applications, and an analytics engine that ensures relevance and context to customer engagement. UniServe™ NXT platform enables solutions to build a collection of loosely coupled reusable services, which implement business capabilities by design. This ensures continuous delivery of large and complex solutions at ease. It also enables an organization to Innovate and evolve its technology stack. In today’s connected world, it’s imperative to deliver an advanced customer experience. UniServe™ NXT enables businesses to collect, process, and derive insights from data generated by IoT devices. UniServe™ NXT empowers enterprises to transform their repetitive, manual processes with Bots and AI to ensure that IT operates on focused teams for very high efficiency. Bots are used to provide faster results and accurate decisions all through the journey of production, resulting in 10x faster delivery. Security services of UniServe™ NXT platform empower enterprises to be more secure and connected. The platform is powered by next generation technology, such as RBAC (Role-Based Access Control) and ABAC (Attribute-Based Access Control), which makes privacy, security of data by design.